"The Difference Between Dreams and Goals Is That Dreams Are Where We Want To End Up, And Goals Are How We Get There"
Don't Just Set Goals, Make Deals!!! Individuals get upset when people break the promises they made to them. Unfortunately, the majority of these same individuals will not get upset when they do not keep their word to themselves. Goals are not just an idea, it is an agreement that is a DEAL you made with yourself. You are letting yourself down when you do not live up to your own expectations. Below are ingredients to ensure you are achieving your goals by focusing on making a DEAL with yourself. When creating your goals follow the the steps below. Extensive goals are the culmination of what you want to accomplish and how you want to accomplish it. When identifying your extensive goals, imagine being able to look into the future and witness your retirement dinner. Performance goals are result-oriented FEED BACK goals. They are clearly measurable through given feedback from a third party. They are usually are most effective if they emphasize accomplishments in the next twelve months (can be a shorter or longer time length depending on the Extensive goal). Routine goals are the "what it takes" to achieve the performance goals you set. Routine goals also must be specific enough to be measurable. These goals are completed on a daily basis. If the routine goal can not be completed on a daily basis then create a "routine" schedule around the goal. It is important to write your goals down and let others know of your intentions. The act of writing down as well as talking about your goals makes them more a part of your reality. The more you can see and recite your goals, the more steadily they move from your subconscious into your awareness. "Never make excuses. Your friends won’t need them, and your foes won’t believe them." Excuses promote underachieving. For goals to work, they must become a part of daily training. 1. Create your WHY statement along with your Self Image. This will include steps to achieve your Extensive goal (ultimate desired accomplishment). 2. At the end of each night, complete your Success Log. The Success Logs ask individuals to answer the following questions: What did I do well today? Based on today’s performance, what do I want to improve? How can you improve on the problem and what objectives will you achieve for the following day? 3. Complete your Mental workout. Review your Success Logs before completing your mental workout. By reviewing your logs and your Self Image before going through your mental workout will allow you to hold yourself mentally accountable while also understanding your progress during this process. 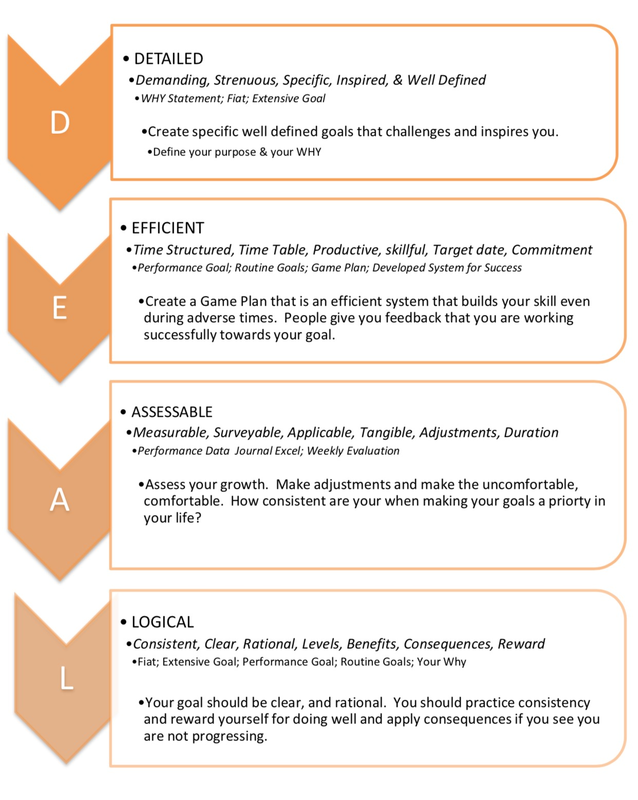 Everyone loves the ideal of creating goals, but does that goal fit you? Are you willing to make the sacrifices needed to achieve those goals. After listing your Extensive Goal, make sure to identify the obstacles, personal sacrifices and character strengths required to live out your dream. Defining your personal vision is essential to selecting the right goals. If you do not complete this simple step, it may take you longer to achieving your goal or worse, you may never achieve your goal. Bad DEALs do not work out well for anyone. Good DEALs workout well for only one party and great DEALs workout for everyone involved. When creating a deal with yourself, you are creating a deal with your mindset, spirit and your body. Your spirit (your WHY), mindset and body have to work in unison and be capable of achieving the task or pursuing the goal will be in vein.